Stone size: Large stone: 6x4mm pear. Small stone(s): 2.25mm round. Ring with 4 stones measures about 10mm at the widest top center measurement. 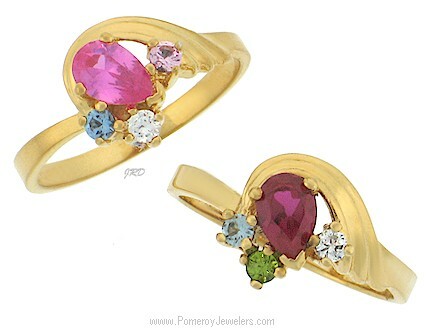 This ring accepts 3-9 stones. Each ring sold separately. NOTE: Some simulated stones may also be offered as an option. YES, a sample is available! is available for inspection prior to purchase. Select Sterling Silver, 10k, or 14k gold & number of stones. Some genuine stones selected are added to this base price. Production time is approximately 3-8 days PLUS delivery time to you. Specializing in birthstone jewelry for mothers since 2000.